Paragliding at Pokhara is a short adventurous activity in Nepal that offers magnificent views of soaring white peaks, Fewa Lake, and the entire Pokhara Valley. 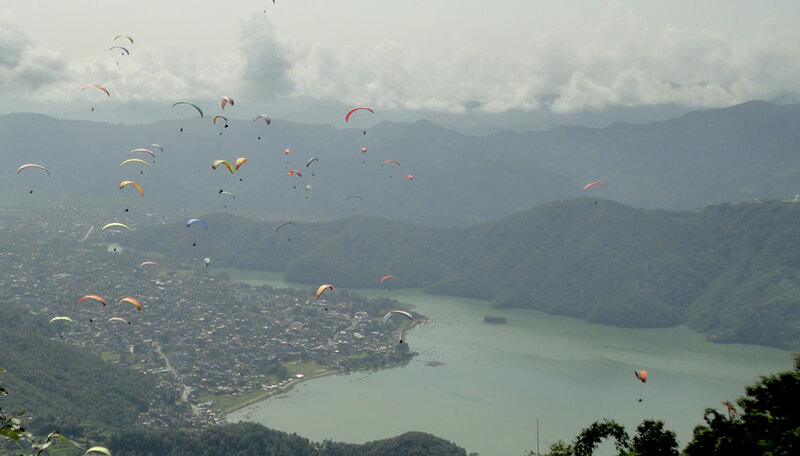 Paragliding at Pokhara is operated from the hill station at Sarangkot which is 8 km far from the Lakeside. Our guide will pick you up from your hotel and drive to Sarangkot Hill. As you gradually drive up to the hill, the beautiful Pokhara valley and Annapurna Range Himalayas will be seen. Check the flying point and starts courageous paragliding. Approximately 20/25 mins will be the flying duration. Then, land near the Fewa Lake and drop back to your hotel. Day 01: Paragliding at Pokhara. Morning picks up from your hotel. Then, drive to Sarangkot which is 8 km far from Lakeside and takes 20/25 mins. Check the flying point and starts Paragliding. After flying 20/25 mins land near the Fewa Lake and drop back to your hotel. Trip finished here! Pick up and drop by a private car. Wants some modification on Paragliding at Pokhara itinerary? contact us to customize it.